When should you start mowing? Start each spring by cutting the lawn before it turns green and begins growing. Clipping off the old dead tips gives the lawn its cue to start growing. The sooner you get the lawn growing the better you can crowd out the weeds before they start. 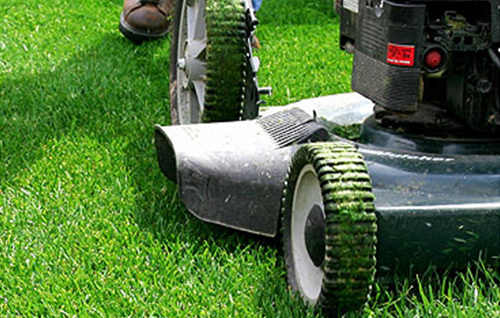 How often should you mow? Normally weekly mowing is the rule, but some lawns need cutting more often. Other lawns will grow more slowly and might need cutting only once every ten days or two weeks. Generally, don’t cut off more than one third of the grass blade. More than that may harm the grass. Let the length of the lawn be the judge, NOT when the lawn was last mowed. Always have sharp blades. Dull mower blades tend to rip the blades of grass as opposed to cutting them. Every torn blade is an opening for disease and causes stress to the lawn. Mowing a lawn when it is wet tends to cause the same problem, so try to avoid it if possible. If you do mow when the lawn is wet, you’ll end up with ruts, and the grass will begin to lean over making it difficult to get a good cut. As long as you have a healthy lawn already and no problems with thatch, feel free to leave the clippings when you mow. Mulching is good, but it is not a necessity. As long as the clippings are not excessive, they will not harm your lawn. The clippings will break down within a short period of time and will provide nitrogen to your lawn. The longer you let your lawn grow (speaking in terms of length, not necessarily time) the longer your lawn’s root system will grow. The longer the root system, the healthier and more stress resistant your lawn will be. The more stress and drought resistant your lawn, the less watering that has to be done. In addition, tests have shown that letting the lawn grow to lengths of 2½-3″ reduce the number of weeds in the lawn by reducing the amount of sunlight reaching the weed seeds. Longer blades also have more surface area available for photosynthesis, which produces life-giving food and energy for the lawn. For the last cut of the season, make it a short one. Leaving the lawn short for the winter reduces the chance of matting that contributes to winter kill damage.